“Future Union players” are those who have always been serious candidates for Bethlehem gameday 18s or have become so and have survived the end of season roster cull. We do not discuss Academy players who have not yet actually played for Bethlehem. Bethlehem’s season divides into unequal halves: Conditioning the first team bench, then evaluating those about to leave for NCAA programs and those who are mid-season youth signings. Mid-to-late May has been the usual transition point. Union players always start when in Bethlehem’s gameday 18. Over the last three years, there are only two exceptions. While Ernst Tanner’s recent comments about tactical flexibility are intriguing, they are too vague to challenge the assumption of the 4-2-3-1 that follows below. Until MLS cup is over, the Union roster remains frozen. So first-team signings speculated about below would be on hold until the second week of December. 2018 Steel minutes in parentheses. On Nov. 1, Brendan Burke said if players are returning to the Steel, the organization estimates they are between 12 and 24 months away from the first team in some capacity, except for Selmir Miscic and possibly Brenden Aaronson. The links find Union writer and former PSP contributor Adam Cann’s article about the players on the first-team website, if there is one. Qualitative description: In seven of his starts, Jones covered for James Chambers when the Bethlehem captain was hurt. In the others, Jones was assigned to improve specific aspects of his game by the first team. His last Steel appearance was July 11, 16 days short of exactly 24 months after he signed with the Union as a homegrown player. Estimated future: Jones has consistently been part of the Union’s game day 18 since mid-July. He may approach the end of his opportunity to prove himself to the first team, but he seems to finally be doing it. As evidence, recall the Portland, Seattle, and Sporting Kansas City games. Haris Medunjanin may no longer be able to sustain being an ironman, so Jones may get more opportunity, in line with Tanner’s end-of-season press conference about becoming harder to play against. A strong preseason performance is imperative. Qualitative description: After the regular-season shellacking at Pittsburgh Sept. 7, Fontana stopped appearing at attacking center mid, switched to center mid, and markedly improved his effectiveness. He began to show flashes of excellent spontaneous technical creativity during the run of play. He now seems more credible as an No. 8 than he ever has as a No. 10. He started as a defensive midfielder in the USMNT U20s match v. St. Vincent & the Grenadines 11/7 and had an assist and a hat trick. He seemed to understand that position well, albeit against admittedly lesser opposition. He was replaced for the knockout stages of the qualification tournament. Estimated future: In discussing Fontana’s departure for the USMNT U20s now-successful attempt to qualify for the U20s World Cup next year in Poland, Adam Cann stated he was only “scratching the surface” of his potential. He is not yet ready to backstop Borek Dockal at the No. 10 nor Alejandro Bedoya at the No. 8 against top teams. He lost some time to injury two years ago and then again this season, so remaining injury-free next year is a priority. He needs to be tested against significant opposition in the coming preseason. If he’s not away at the FIFA U20 World Cup, Fontana should begin 2019 as Bethlehem’s starting center midfielder next to James Chambers, with the goal of moving into the Union’s game-day 18 by mid-season. Qualitative description: Real made USL’s “20 under 20” list for 2018. He currently captains the USMNT U20s efforts in the CONCACAF championship mentioned above. He had just one fewer tackle than Bethlehem’s leading tackler Matt Mahoney –in 1,200 fewer minutes. Since the middle of Bethlehem’s season, Brendan Burke has consistently praised his play at left back. Real’s judgment when to move forward into the attack seems more judicious in its aggression this year than last. He consistently frees himself to deliver service when in the attacking third. Estimated future: In the Union’s defensive roster emergency last spring he made three inconsistent, overmatched first-team starts and was correctly replaced by Ray Gaddis. The quality of the second half of Real’s USL season and his solid recovery from injury late in the year suggest he will be given every opportunity to become part of the Union game day 18 next February. If he does well in a preseason that Jim Curtin yesterday called “critical” for him, given what Curtin did with Auston Trusty a year ago, he might start at left back in the MLS opener. His play against Pittsburgh in the playoff win made a statement. He was absent for the Louisville playoff-ender. He captains the the USMNT U20 side that will go to its world cup in Poland next year, so he will need a back-up. Qualitative description: The single most important achievement for Mbaizo has been gaining English language competence. The second has been integrating into the life of the team. On the pitch he loves to attack, sometimes needing loud, cross-field, peer reminders to defend first. He has good pace and excellent technical skill, making him a meaningful threat when the Steel were in possession in the attacking third. He played very well in the first-team-reserves’ victory over Sporting Kansas City when he came off just before the final whistle with cramps. Estimated future: Defensive consistency and dominating first-quality MLS wingers will determine his role next season. He could easily become part of the game day 18 by next June after early-season conditioning and another dominant tour with Bethlehem. Keegan Rosenberry has been having meaningful practice competition from a superior athlete whose understanding of his role and passing skills still need work. He seems a bit robotic at times rather than creatively fluid in his decision making. Estimated future: Aaronson is not yet ready to “next-man-up” behind Borek Dockal, or any possible successor, at an MLS-dominating level. He will go to Florida in preseason and needs to be tested rigorously against significant opposition. But unless there is a major leap of both physical endurance and offensive dominance, he should spend 2019 at attacking center mid in USL, building both that endurance and dominance while working in front of Fontana and Chambers. Qualitative description: Ngalina practiced with the first team immediately upon his arrival. He then had some practice time with Bethlehem, but quickly returned to the first team’s practice pitch. He had two non-league appearances in first-team games, and dominated a credible MLS left back in the first USL match against Red Bulls II forcing a halftime replacement. He possesses elite pace to go with top-quality change of pace and direction while dribbling. He is good about his defensive responsibilities. His slight stature means he gets clobbered periodically. Estimated future: He has displaced Marcus Epps, Fabian Herbers, and possibly C.J. Sapong, and will almost certainly sign with the Union after the roster freeze ends. Adding 10 to 20 pounds of muscle will help him endure the physicality of MLS and better resist injury. If 2019 preseason in Florida goes well, he could be in the game day 18 from day one, pushing David Accam and Sapong hard if not supplanting them. Qualitative description: The striker in the Union system has responsibilities that are complex to learn on both sides of the ball. Faris played a full 90 minutes only once, but he is making good progress. In the playoffs he learned not to be intimidated by USL physicality, but he now needs to learn how to give punishment to defenders without fouling. His older teammates are encouraging him to use all the different methods by which a striker loses defenders, not just superior athleticism. He looks to create his own shots, as a striker should. The defensive responsibilities of the position have not yet become unthinking instinct. Adding strength and weight is a future opportunity even though he has the upper body of a high school linebacker. 18-year-olds do that naturally, and the organization’s use of the weight room will augment nature. Estimated future: He will spend 2019 as Bethlehem’s starting striker, practicing with the first team frequently if not regularly. Signing with them will not occur immediately, as it did not with Cory Burke. He will be one of the Union’s three rights-of-first-refusal on Bethlehem’s roster, to avoid him being poached. We should expect him to go with the first team to Florida. Whether he returns there after Valentine’s Day will tell us how he has done. Qualitative description: Last February, Ofeimu was at least a step slow and coltishly awkward controlling those long legs. (He stands 6’3”). Not any more. Brendan Burke answered a PSP question about his quickness smiling something to the effect that they would just have to find to find out two days before Ofeimu started at North Carolina. 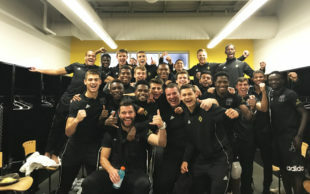 He scored the first goal in a 2-1 comeback win that caused the James Chambers’ post-game quote, “This team doesn’t know when it’s dead.” After the Academy season was over, Ofeimu began practicing daily with the Steel, and by the homestretch he had displaced left center back Brandon Aubrey to the bench. His coach has repeatedly complimented him on his disciplined, focused achievement of a goal, just as he always mentioned that whenever Ofeimu had started, Bethlehem had not lost. That detail ended in the playoff game in Louisville, unfortunately. But in that game the Louisville manager replaced his frustrated, scoreless striker, All-League MVP runner-up Cameron Lancaster before time. Ofeimu played a major role in that decision, along with Brandon Aubrey, Olivier Mbaizo, Matt Mahoney, James Chambers and Drew Skundrich. We have not heard tell of Ofeimu practicing with the first team… yet. Estimated future: Once both roster freezes lift, Ofeimu will almost certainly sign with either the Steel or the Union. There is now urgency for the Union at center back, given first-team cuts. His 2018 USL minutes are sufficient to judge his potential fairly but not to polish him to MLS readiness. Daily practice with the first-team and playing regularly with Bethlehem is the path most likely to develop him, the footsteps of Auston Trusty and Mark McKenzie. We also mention Mike Pellegrino, because this time last year he would have been on this list. Pellegrino endured a series of in-season, non-injury, medical circumstances that have significantly retarded his opportunities to develop as a potential professional. He will continue to work his way back and matriculate at Notre Dame. Coach Burke and coach Hogan will watch both his college career and his presumptive PDL one as he restores his athleticism to its full potential. The coaches will ensure that were the circumstance to arise, he would qualify as a homegrown player. Thanks for all the great Steel info. Your stuff always gives my hope for the future, regardless of how the Union are playing. I just describe what Coach Burke and coach Hogan get their students to achieve. They don’t achieve it, I can’t describe it. Chambers is pace, pure and simple. If he had it, he would be playing on the eastern side of the Irish Sea, not here. Mahoney would be stature most likely. Maybe elite levels of p6ace. And technical flair. Great and informative as usual! While I’m not quite as rosy on these prospects, they have potential and good coaching could unlock them. A small quibble on Tomas Romero: if he doesn’t step off his line and wander into no man’s land, that Indy striker doesn’t attempt the chip and doesn’t score. Hopefully he can iron it out, but Romero can be over eager to leap off the line. He’s young, still time to develop!